ALBUQUERQUE, N.M. — Sandia National Laboratories won four regional awards from the Federal Laboratory Consortium (FLC) for its work to develop and commercialize innovative technologies. 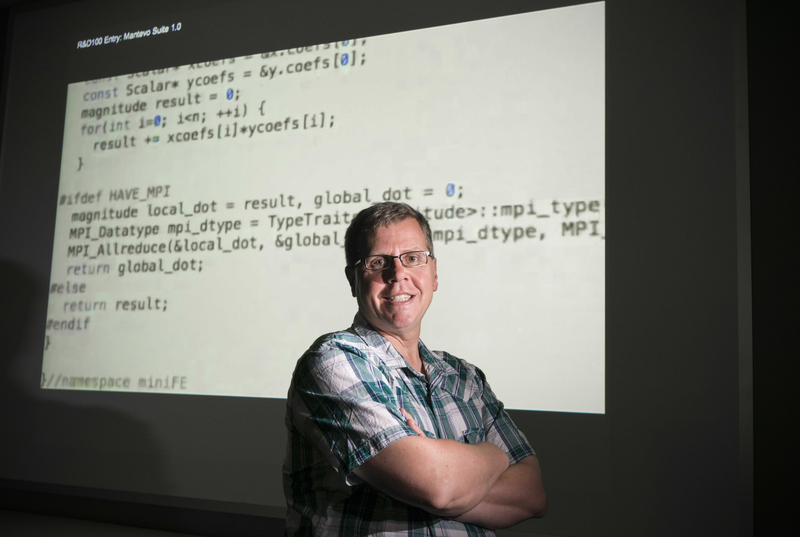 Mike Heroux of Sandia National Laboratories, co-lead of the Federal Laboratory Consortium award-winning Mantevo project, shows the code from the Mantevo miniapp MiniFE. (Photo by Randy Montoya) Click on the thumbnail for a high-resolution image. The FLC is a nationwide network of more than 300 members that provides the forum to develop strategies and opportunities for linking laboratory mission technologies and expertise with the marketplace. H2FIRST, an effort to increase the number of fueling stations for hydrogen cell electric vehicles, as the Outstanding Regional Partnership, involving Sandia and the National Renewable Energy Laboratory, California Fuel Cell Partnership, California Governor’s Office of Business and Economic Development, and California Air Resources Board. Some 354 small companies in 29 counties participated last year in NMSBA, a public-private partnership among Sandia, Los Alamos National Laboratory and the state of New Mexico that connects small business owners with scientists and engineers who provide technical assistance. The program also contracts with the New Mexico Manufacturing Extension Partnership, the University of New Mexico Management of Technology program at the Anderson School of Management, Arrowhead Center at New Mexico State University and New Mexico Tech Department of Management. NMSBA provided $4.6 million worth of assistance to New Mexico small businesses last year. NMSBA was created in 2000 by the state Legislature to bring national laboratory technology and expertise to small businesses, promoting economic development with an emphasis on rural areas. The program has provided 2,195 small companies in all 33 New Mexico counties with more than $39 million worth of research hours and materials. More than 3,500 jobs have been created and retained as a result of NMSBA. Mantevo is an integrated collection of small software programs, or miniapps, that model the performance of full-scale applications yet require code a fraction of the size. They were designed to improve high-performance computing. 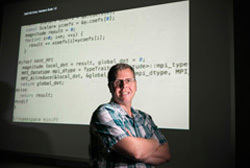 The Mantevo project, which grew out of Laboratory Directed Research and Development and won a 2013 R&D 100 Award, pioneered the miniapp concept. Mantevo Suite 1.0 is the first integrated collection of full-featured miniapps. Sandia brought the Mantevo miniapps together and made them freely available as an open-source software package. Every major computer vendor and dozens of university research teams use Mantevo to design next-generation systems and tools. The work was done in collaboration with, among others, Los Alamos and Lawrence Livermore national laboratories and Santa Clara-based NVIDIA Corp.
Electricity-generating plants, especially coal-fired plants, and other industrial activities that generate carbon dioxide face new U.S. Environmental Protection Agency regulations limiting emissions. Nano-stabilized enzymatic membranes for CO2 capture provide a simple, compact and more energy-efficient approach to capture than conventional methods. The process removes 90 percent of the CO2 in emitted gas mixtures and is expected to save the U.S. coal industry alone $90 billion a year. The enzymatic membrane technology uses computational modeling to design and nanofabrication techniques to synthesize membranes with thin, narrow and airtight liquid layers. By embedding an enzyme that converts CO2 gas into a more soluble form, the liquid-layered membranes efficiently capture CO2 from power plant flue gas. Researchers from Sandia and the University of New Mexico partnered to develop the technology. 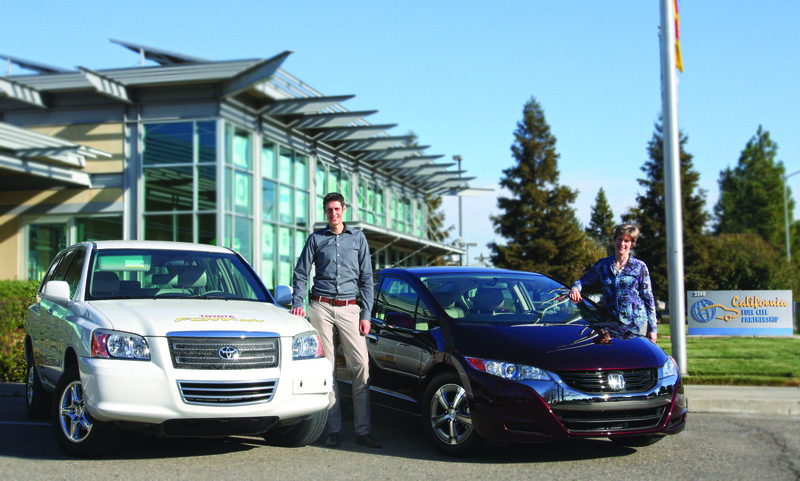 Daniel Dedrick, Sandia National Laboratories hydrogen program manager, and H2FIRST partner Catherine Dunwoody of the California Fuel Cell Partnership are working to install more fueling stations for hydrogen fuel cell cars. 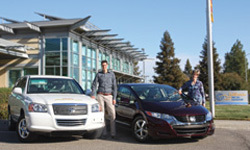 (Photo by Juan Contreras, California Fuel Cell Partnership) Click on the thumbnail for a high-resolution image. As hydrogen fuel cell vehicles continue to roll out in increasing numbers, the infrastructure for fueling them must expand as well. A project launched by the U.S. Department of Energy and led by Sandia and the National Renewable Energy Laboratory will work in support of H2USA, the public-private partnership introduced in 2013 by the DOE and industry stakeholders to address the challenge of hydrogen infrastructure. Established by the DOE’s Fuel Cell Technologies Office in the Office of Energy Efficiency and Renewable Energy, the Hydrogen Fueling Infrastructure Research and Station Technology (H2FIRST) project will draw on existing and emerging core abilities at the national labs to reduce the cost and time of new fueling station construction and improve the stations’ availability and reliability. The partners include several agencies from the state of California, widely regarded as the nation’s epicenter of zero-emission vehicles. The goal is to accelerate and support the widespread deployment of hydrogen fuel cell electric vehicles. Toyota recently announced it will begin selling a fuel cell vehicle in 2015. General Motors and Honda announced plans to jointly develop hydrogen fuel cell cars and Hyundai will lease its version in California.